About - Stiglmeier Sausage Co. Inc.
Anton Stiglmeier mastered the secrets of sausage making as an apprentice growing up in Munich. Meanwhile, his future wife Gertraud was learning how to sell sausage in Garmisch, a small town nestled in the Bavarian Alps. When they immigrated to Chicago in the 1950s, they brought with them all the tastes and traditions of their native Bavaria—a land known for Oktoberfest, great beer, and delicious sausage. It’s on these traditions, along with their old-fashioned family values, that they founded Stiglmeier Sausage Co. in 1960. And with the addition of their children John and Elizabeth, their family has been making their authentic German sausage ever since. What comes out of the grinder depends on what goes into it. Thousands of sausage lovers enjoy Stiglmeier sausage each year. As business outgrew our shop in Chicago, we moved to a state-of-the-art “wurstküche” in Wheeling, Illinois. 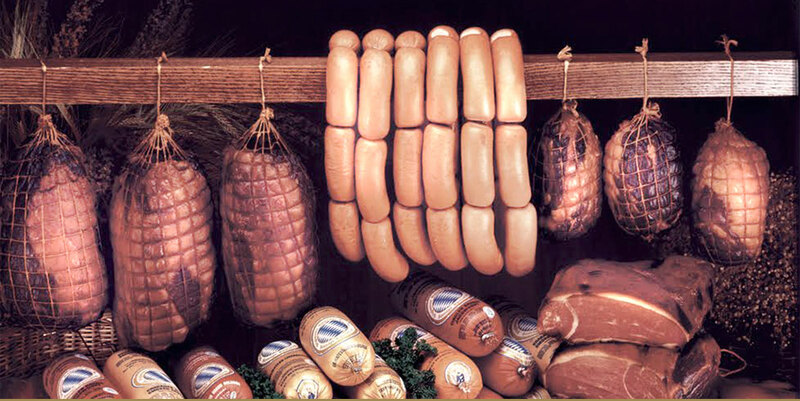 Here, we combine the freshest, high-quality meats and spices we can get our hands on, and grind them into over 50 varieties of gourmet German sausages and deli meats. Shop our collection of Bavarian-inspired products and taste them yourself! Our products are of the highest-quality and freshness. That’s our promise. All Stiglmeier products are USDA approved, and they contain no fillers and only the absolute minimum of preservatives. Our shipping practices ensure that your sausage arrives as fresh and delicious as possible. Check out our shipping page to learn more about how your sausage is packed and how to properly store it for continued freshness and flavor! All currently available products are shown on this web site or in our current price list. However, if a particular product you have ordered is temporarily out of stock, we may substitute it for an item of equal value. Prices are subject to change without notice.